Æthelflæd [Ethelfleda] (d. 918), ruler of the Mercians, was the daughter and first-born child of Alfred (d. 899), king of the West Saxons and later of the Anglo-Saxons, and his wife, Ealhswith (d. 902), daughter of Æthelred, ealdorman of the ‘Gaini’, and Eadburh who, according to Alfred’s biographer Asser, was a member of the Mercian royal house. Æthelflæd was born probably in the early 870s. By the time Asser had begun writing his life of Alfred in 893, and perhaps as early as 887, she had married the Mercian ealdorman and ruler Æthelred, who was certainly older, perhaps much older, than her. In the two or three years after the disappearance from the scene of Ceolwulf II in 879, Æthelred had come to rule over the English half of the Mercian kingdom that had been dismembered by the vikings, submitting to Alfred’s overlordship. His marriage to Æthelflæd cemented a close bond, which renewed viking attacks in the 890s only strengthened. After Æthelred fell ill at some time in the decade 899–909 the sources accord leadership of the Mercians to Edward the Elder or to his sister Æthelflæd. The West Saxon version of the Anglo-Saxon Chroniclerecords Edward sending a Mercian army against the vikings in 909 and 910. In the latter year Æthelflæd is credited with the building of a fortification at ‘Bremesburh’ (the location of which is now unknown), by the so-called Mercian register (embedded in texts B, C, and D of the chronicle). It may be this chronicle that is referred to by an early twelfth-century Durham catalogue as ‘Elfledes Boc’ (perhaps ‘Æthelflæd’s book’). She also seems to have had a particular association with Gloucester. The royal hall just outside the town at Kingsholm was used for a great council in 896, the mint was striking coins in the name of Alfred at the end of the ninth century, and the street pattern is strikingly similar to that of some of Alfred’s burhs in Wessex. Æthelflæd was responsible for the foundation of a new minster at Gloucester, originally dedicated to St Peter (and not to be confused with the old minster of St Peter, on the site of the modern cathedral). The church was a variation on an insular theme: a rectangular structure with a western apse, an unusual feature in England that must have owed something to Carolingian architecture. On Æthelred’s death in 911, Æthelflæd was accepted as ruler by the Mercians: thereafter, the Mercian register describes her as Myrcna hlœfdige, ‘Lady of the Mercians’, the precise equivalent of Æthelred’s habitual title of Myrcna hlaford, ‘Lord of the Mercians’. Æthelflæd’s direct replacement of her husband seems to have encouraged her brother Edward to attempt to establish his family’s control of Mercia. He had already sent his son Æthelstan to be brought up by his sister and her husband. On the latter’s death he assumed direct jurisdiction over London and Oxford, two towns which Alfred had earlier put under Æthelred’s control and which were vital to the make-up of the kingdom of the Anglo-Saxons. As the Mercian register makes clear, Æthelflæd shared in her brother’s effort to reconquer the Danelaw. The first attack came in 909, when the Anglo-Saxon Chroniclerecords that Edward sent a combined army of West Saxons and Mercians into the territory of the northern Danish army. It must have been this force that brought back to English Mercia the relics of the seventh-century Northumbrian royal saint Oswald from their resting-place at Bardney in Lincolnshire. Æthelflæd had them translated to her new minster at Gloucester, which afterwards took that saint’s name. The essential precursor to systematic reconquest was the extension into Mercia of the system of fortified sites—burhs—which Alfred had begun to construct in Wessex. These served the dual purpose of consolidating the defence of English territory and providing bases for attacks on viking-occupied areas. Sometimes two were built in one location, to dominate both banks of a river. While Æthelred was still alive, in addition to ‘Bremesburh’, Worcester (between 887 and 899) and Chester (907) had been fortified. Thereafter, brother and sister seem to have co-ordinated their construction programme. In 1912, at Bridgnorth and perhaps at the unlocated ‘Scergeat’, Æthelflæd had burhs built to prevent crossings of the Severn, which viking armies had accomplished twice in living memory. Edward constructed two at Hertford to defend the southern part of Mercia which he controlled and, having moved into Essex, one at Witham. In 913 Æthelflæd responded to viking raids into Edward’s territory by fortifying Tamworth and Stafford. The gap between Tamworth and Hertford was plugged in 914, when Edward had two burhs built at Buckingham, and Æthelflæd one at Warwick, while she also strengthened her northern defences with a burh at Eddisbury and, in 915, those of the Wirral with one at Runcorn. The burh at Chirbury, and perhaps that at the unlocated ‘Weardburh’, shored up the frontier with Wales in the same year, and Edward fortified Bedford, having received the submission of its viking army. In 916 he protected Essex from seaborne attack with a burh at Maldon. Æthelflæd must also have rebuilt the defences of Gloucester and Hereford during this period. This activity provided the bases for the successes of 917. In that year, after Edward had ordered the occupation and fortification of Towcester, three separate viking forces attacked English territory, but were rolled back. Before the end of the year, all the Scandinavian armies of East Anglia had submitted to Edward and offered him their allegiance. In the meantime Æthelflæd sent an army that attacked and captured Derby and the area of which it was the centre, the first of the viking ‘Five Boroughs’ of the north-east midlands to fall. She lost ‘four of her thegns, who were dear to her’ there (ASC, s.a. 912, recte 917). In the following year, a co-ordinated campaign to capture the remaining four viking strongholds took Edward to Stamford, while Æthelflæd entered Leicester without opposition. She died, however, at Tamworth on 12 June 918, not sharing with her brother the completion of the reconquest of the southern Danelaw. In the period of these campaigns, Æthelflæd also had other concerns that she seems to have tackled independently from Edward. There may be a kernel of truth behind the report of the Irish ‘fragmentary annals’—a late source, heavily embroidered with legendary accretions—that she led a combined army against the viking Ragnall (d. 920/21) at the second battle of Corbridge in 918: she may at least have sent a Mercian force to bolster that of Ragnall’s northern opponents. She may even, as the ‘fragmentary annals’ go on to suggest, have made an agreement with the Picts and the Scots for co-ordinated action against recently arrived Norse aggressors in Northumbria. Her prominence in the north is indicated by the Mercian register, which states that in 918 the men of York offered her their submission and allegiance. She can therefore be seen as laying the foundations for Edward’s (temporary) pacification of the north in 920. Relations with the Welsh are harder to fathom, the only recorded event being an expedition in 916 which captured the wife of the king of Brycheiniog as punishment for the murder of the Mercian abbot Ecgberht and his companions. Æthelflæd was buried alongside her husband in the east porticus of her minster at Gloucester. Following her death, Edward initially allowed her daughter Ælfwynn, who must have been nearly thirty but was still unmarried, to hold a nominal rulership over the Mercians. After six months, however, she was ‘deprived of all authority in Mercia’ and carried off to Wessex (ASC, s.a. 919, texts B, C, D). At about the same time, the West Saxon version of the chronicle reports that all the people of Mercia, Danes and English, submitted to Edward. This act may have been premeditated: Edward’s dispatch of his eldest son, Æthelstan, to be brought up among the Mercian aristocracy suggests as much. The bringing together of two (or, with the Danes, three) peoples under one rule did not amount to the creation of a single state, at least initially, but it does seem to have provoked some resentment among the Mercians, which lay behind a rebellion at Chester in 924. It is not known whether Æthelflæd herself approved of her brother’s moves towards single rulership. In this context it is notable that her career emerges largely from the Mercian register, while the West Saxon version of the chronicle (text A), written within a few years, minimizes her significance. The latter text does not, however, obscure Æthelflæd’s achievement, by dint of her high birth, her marriage, the political situation, and, it seems sure, her own ability, of a distinctively prominent role for a woman of her era. It made an impression on later generations. Writing c.1130, Henry of Huntingdon declared her ‘to have been so powerful that in praise and exaltation of her wonderful gifts, some call her not only lady, or queen, but even king’ and follows this with a poem describing her as ‘worthy of a man’s name’ and ‘more illustrious than Caesar’ (Henry, Archdeacon of Huntingdon, 309). Behind this twelfth-century rhetorical gloss lies recognition of the vital role that Æthelflæd played in the creation of the English kingdom. Below is a list of places that had some significance during Aethelflaeds life and places on which she had influence with links to references highlighted in blue. Capital City of Mercia and Aethelflaed and Aethelred, the city was rebuilt from the Roman ruins to a plan devised and implemented by Aethelflaed. Buildings founded by her include St Peters Priory, now the site of Gloucester Cathedral and St. Oswalds Priory, the burial place for Aethelflaed and Ethelred. Warwick(914);With Danish invaders threatening, Ethelfleda, daughter of Alfred the Great, orders the building of a ‘burh’ or an earthen rampart to protect the small hill top settlement of Warwick. Three other fortresses, at Bremesburh ( probably Bromsgrove or possibly Bromyard), Scergeat and Weardbyrig (Wednesford? ), have yet to be located. For the full 1 Hour video please follow this link https://itunes.apple.com/gb/tv-season/the-lady-of-the-mercians/id867520358?i=873368420&showLC=true&ign-mpt=uo%3D4 N.B. Currently this has a cost of £1.89 but well worth it. The short or unaccented Anglo-Saxon æ has a sound like ai in main and fairy, as appears from these cognate wordsWæl wail, brædan to braid, nægel a nail, dæg, spær, læt, snæce, mæst, æsp, bær, etc.2. The short or unaccented æ stands only1. before a single consonant; as Stæf, hwæl, dæg:2. a single consonant followed by e in nouns; Stæfes, stæfe, hwæles, dæges, wæter, fæder, æcer:3. or before st, sc, fn, ft; Gæst, æsc, hræfn, cræft:4. before pp, bb, tt, cc, ss; Æppel, cræbba, hæbben, fætte, fættes, wræcca, næsse:5. before double consonants, arising from the inflection of monosyllabic adjectivesLætne, lætre, lætra, from læt late; hwætne, hwætre, hwætra from hwæt quick.3. In the declension of monosyllabic nouns and adjectives, e is rejected from the short or unaccented æ, and becomes a, when a single consonant, or st, sc, is followed by a, o, u in nouns, and by a, o, u, e in adjectives; as Stæf, pl. stafas, g. stafa, d. stafum; hwæl, pl. hwalas; dæg, pl. dagas. adj. Læt late; g. m. n. lates; d. latum; se lata the late; latost, latemest, latest: Smæl small; g. m. n. smales; d. smalum; se smala the small, etc. See short a in B. 3, p. 1, col. 1. 4. æ-, prefixed to words, like a-, often denotes A negative, deteriorating oropposite signification, as From, away, out, without, etc. Like a, ge, etc. æ is sometimes prefixed to perfect tenses and perfect participles and other words without any perceptible alteration in the sense; as Céled, æ-céled cooled. In Classical Latin, the combination AE denotes the diphthong [ai̯], which had a value similar to the long i in fine as pronounced in most dialects of modern English. Both classical and present practice is to write the letters separately, but the ligature was used in medieval and early modern writings in part becauseæ was reduced to the simple vowel [ɛ] in the imperial period. In some medieval scripts, the ligature was simplified to ę, small letter e with ogonek, the e caudata. This form further simplified into a plain e, which may have influenced or been influenced by the pronunciation change. However, the ligature is still relatively common in liturgical books and musical scores. The Latin diphthong appeared both in native words (where it was spelled with ai before the 2nd century BC) and in borrowings from Greek words having the diphthong αι (alpha iota). In Old English, æ denotes a sound intermediate between a and e ([æ]), a sound very much like the short a of cat in many dialects of modern English. Anglo-Saxon has many of the letters found in Modern English, as well as three extra letters. The Anglo-Saxon alphabet does not include j, q, or v. The letters k and z are very rarely used and are not usually listed as part of the alphabet. Modern transcriptions of Anglo-Saxon use modern letters, usually all in lower-case. At the time when Anglo-Saxon was written down, there was not a distinction between upper- and lower-case letters. If the font does not include the three extra letters, it is normal to use ‘th’ to represent both þ and ð , while ‘ae’ is used for æ .
Anglo-Saxon had two forms of each vowel, long and short. This was not indicated in the spelling. Modern manuscripts often use the macron (a horizontal bar over the vowel) to show long vowels. Computerised versions will often use a rising accent, since standard fonts do not include versions of the vowels with a horizontal bar over them. If you are lucky enough to have access to original manuscripts in Anglo-Saxon, you will find that many of the letters are unfamiliar looking. The language was written down by monks who used the Irish alphabet, so most of the the letters used are the same as ancient Irish. To represent sounds not found in the Irish and Latin languages, the monks had to adapt versions of the Runic alphabet for the letters w, þ , ð , and æ .
s is represented by a letter like a modern r but with a long descending vertical stroke, like the one on a p.
w looks very similar to a p but is narrower and the curved part descends at 45° to meet the descending stroke. The three letters þ , ð , and æ are all additional to the modern alphabet. Ancient manuscripts sometimes put accents on some of the letters, but it is not clear what they signified. They were not indications of long and short vowels and do not appear to have affected the pronunciation in any way. There is no single definitive set of rules for how Anglo-Saxon was pronounced. Firstly, pronunciation would have varied across England, as it does at the moment. Secondly, scholars are not completely decided on the exact pronunciation anyway. The following rules give a rough guideline. There are seven vowels: a æ e i o u y. In Modern English, y is sometimes a vowel and sometimes a consonant. It was always a vowel in Anglo-Saxon. The long versions of a, æ , and y (with an accent or macron) are the same but held for a longer time. A diphthong is where a vowel is pronounced and then the sound is modified into another vowel. This is done smoothly and quickly, so that the whole thing counts as one syllable rather than two. For example, in modern English, the sounds in ‘tune’, ‘pain’, and ‘sole’ are all diphthongs: tee-oon, pay-een, and so-ull. The two letters þ and ð were interchangeable. Modern scholars often try to use þ for the unvoiced ‘th as in thin’ sound and ð for the voiced ‘th as in this’ sound, but this was not the practice of the ancient scribes. Exceptions: sc in ascian (to ask) is pronounced sk. The gy- prefix at start of some words is sometimes an alternative spelling of the prefix gie. In this case, it is pronounced with a y sound. The cg in docg (dog) is pronounced with a hard g.
Like in Italian and Finnish, doubled letters sound longer than single letters. All letters are pronounced. So g at start of gnæ t (gnat) is pronounced, as are h at start of hwæ t (what) and e at end of sunne (sun). •865 A Great Army arrives from Denmark and sets about conquering Northumberland. •866 Northumberland is conquered by the Danes. They develop Jórvík (York) into their main city. •870 The Danes conquer East Anglia. •871 Another army arrives from Denmark to reinforce the Danes and they set about extending the Danelaw into Mercia. The young King Alfred ascends the throne of Wessex. •872 Æthelflæd is born at the height of the Viking invasions of England. She is the eldest child of Alfred the Great of Wessex. •874 Most of Mercia has been overrun. The Danelaw now extends from London northwards. Only Wessex is left out of the old kingdoms. •876 The Danish leader, Guthrum, launches a surprise attack on Wessex and utterly defeats Alfred’s army. Alfred and his remaining troops flee from the battle to take refuge in the Somerset Marshes. •876-8 Alfred’s troops harass the Danish forces and secretly build up a fresh army. •878 May 6th-12th – King Alfred launches a surprise attack on the Danes and completely defeats them in battle at Thandun or Edington. He then pursued the Danes to their stronghold at Chippenham and starves them into submission. •880 Alfred starts building a chain of burhs (forts) along his borders. Alfred and Guthrum agree a treaty. Guthrum is baptised as a Christian. The treaty divides Mercia, Alfred gains western Mercia; Guthrum incorporated the eastern part of Mercia into an enlarged kingdom of East Anglia (now known as the Danelaw). •886 King Alfred captures London from the Danes and then returns the city to the Mercians. His prestige among the Anglo-Saxons shoots up and Æthelred, ruler of the remaining Mercia, acknowledges Alfred as his overlord. •887 To cement their alliance, Alfred offers Æthelflæd in marriage to Æthelred. She is about 15 years old. •890 King Alfred orders the Anglo-Saxon chronicles to be started (recording a history of England). They are maintained and added to by generations of anonymous scribes until the mid 12th Century. •892 Another great Viking army arrives in force. They find a kingdom defended by a mobile field army and a network of garrisoned fortresses. A four-year struggle between King Alfred and the Vikings starts. •895 Edward’s son Athelstan is born. As the future king, when he is old enough, he is sent to his aunt in Mercia to be educated and trained in military arts and diplomacy. •896 The Vikings withdraw and all the Anglo-Saxons regard Alfred the Great as their king, the king of England. •899 Alfred the Great dies. His wife goes to a convent in Winchester. His son, Æthelflæd’s brother, Edward the Elder, becomes king of Wessex. •902 Æthelred falls ill and withdraws from political life. 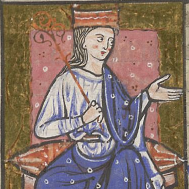 Æthelflæd, herself became the effective ruler of Mercia. •905 Æthelflæd & Æthelred repulse the Norse settlers from taking the important city port of Chester. •907 City of Chester is fortified. With her brother, King Edward of Wessex, she raids Danish East Anglia and brings back the captured body of St. Oswald to Gloucester. At about this time, Æthelflæd has Gloucester rebuilt from the Roman ruins and lays out the core street plan, which is still in existence today. •910 Together the forces of Wessex and Mercia repulse the last major Danish Army sent to ravage England in the battle of Tettenhall in Lincolnshire. Æthelflæd wins the support of the Danes against the Norwegians, and enters into an alliance with the Scots and the Welsh against the invaders. •911 Æthelred dies. Æthelflæd becomes the sole leader of Mercia. The people call her Myrcna hlaefdige, “The Lady of the Mercians”. She continues to co-operate with her brother, Edward. •912 Æthelflæd expands her policy of building burhs to defend Mercia against the Vikings. She builds fortifications at Scergeat and Bridgenorth. •913 Further burhs or fortifications are built at Tamworth and Stafford. •914 Further burhs or fortifications are built at Eddisbury and Warwick. •915 Further burhs or fortifications are built at Cherbury, Weardbyrig and Runcorn, now providing a defence around the whole of Mercia. •916 Æthelflæd invades Wales and takes Brecknock, after the murder of Abbot Ecgberht and his companions. •917 Æthelflæd leads her armies against the invaders, successfully besieging and capturing the Viking stronghold at Derby while her brother was taking Colchester. Æthelflæd forms an alliance with kings Constantine II of Alba and Constantine Mac Aed of Strathclyde against Norse York. •918 Æthelflæd begins to engage with disaffected groups within the Norse kingdom and peacefully overruns the Borough of Leicester. Æthelflæd dies at Tamworth, before knowing that the Vikings are willing to accept her as overlord at York. Æthelflæd’s daughter, Ælfwynn is recognised by Mercians as their leader. King Edward the Elder decides that the Mercians might try for independence under Ælfwynn, and his strength against the Danes is in Wessex and Mercia being united. He removes his niece and sends her to Wessex, probably to live her life out in a convent. •954 King Athelstan, Æthelflæd’s nephew unites the whole of England permanently under one ruler for the first time. The kingdom of the English is now the greatest power in the British Isles.